LONDON (8 March 2012) — In the week that Apple launched the iPad 3, National Geographic Traveller (UK) is excited to announce its iPad and iPhone app is now available in the App Store. Free to download, the app appears in the Apple Newsstand on mobile devices. 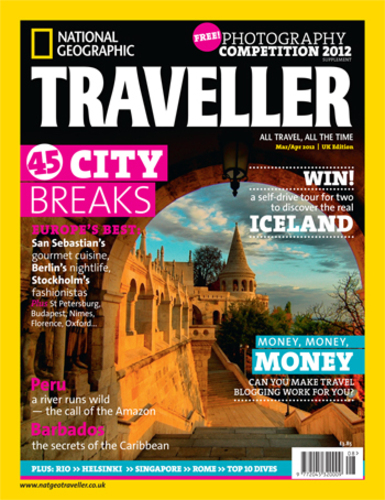 With over 7,000 downloads in its first three days, the app has already proved the demand for a digital edition of National Geographic Traveller (UK) enabling readers to download back issues of the magazine, while offering the option for future issues to be pushed and downloaded in the background. The current issue will all be available to download at a cost of £1.99 per issue, back issues will also be available. Future issues are also available through the auto-renewing subscriptions priced at £7.49 for six months and £14.99 for 12 months. In partnership with PixelMags, the app enables users to read the magazine offline and in landscape or portrait view as well as offering a fast and easy search function, contents menu, bookmark features, sharing facilities and full online support. PixelMags has been developing iOS apps for three years, successfully delivering the content that publishers have created. Through the services that PixelMags offers, publishers can have the capability to reach over 250 million iOS users through Newsstand. Newsstand is Apple’s easy-to-organise bookshelf displaying the covers of all a user’s newspaper and magazine subscriptions in one place. A new section of the App Store features just subscription titles, and allows users to quickly find the most popular newspapers and magazines in the world. If subscribed to, new issues appear in the Newsstand and are updated automatically in the background so you always have the latest issue and the most recent cover art. Download National Geographic Traveller from Newsstand in iOS 5, from the App Store on iPad, or at http://www.itunes.com/appstore. Back issues are being uploaded on a regular basis so if you don’t find what you’re looking for, check back from time to time. Apps for Android and other platforms for the magazine are also set to launch this year. National Geographic Traveller (UK) has a cover price of GBP £3.85, via subscription and on newsstands. For 2012 there will be seven issues (single issues for Sept and Oct) moving to an eight-issue frequency into 2013. Visit http://www.natgeotraveller.co.uk for more information. National Geographic Traveler (USA) is the world’s most widely read travel magazine, created in 1984. It championed sustainable travel before it was cool and, eight times annually, celebrates journeys that are about place, experience, culture, authenticity, living like the locals and great photography. It makes a distinction between tourism and travel and stresses inquisitive, not acquisitive, trips. It employs storytelling and outstanding photography to inspire readers to pick up and go, eschewing fashion and fluff in favour of articles that offer a strong sense of place, inspiring narratives that make readers take trips, and solid service information to help them plan those trips. About PixelMags Inc. PixelMags Inc. is one of the worlds fastest growing digital content distribution companies that is transforming the future of digital publishing by changing how publishers distribute interactive branded content. PixelMags reaches millions of digital readers daily, in over 33 different languages, and represents such publishers as Hearst UK, Crain Communications Inc., Imagine Publishing, Dennis Publishing and more. PixelMags is a privately held company, with offices located in Los Angeles, London, New Zealand and Australia. Follow PixelMags on Facebook (facebook.com/pixelmags) and Twitter (@pixelmags).